A simple air conditioning circuit and cycle diagram that you might find useful. The component at #2 in this air conditioning circuit and cycle diagram is the condenser. Most air cooled air conditioning and refrigeration systems are designed so that the refrigerant will condense at a temperature about 25 to 30 degrees above outside ambient air temperature. When the hot refrigerant vapor discharged from the compressor travels through the condenser, the cool air flowing through the condenser coil absorbs enough heat from the vapor to cause it to condense. If the outside air temperature is 80 degrees, the system is designed so that the temperature of the refrigerant, right at the point where it first condenses, will be about 105 to 115 degrees. This transfer of heat from the vapor to the flowing air is what makes hot air blow out of your air conditioner's condensing unit. And remember, it's at a low pressure, so it's only boiling at about 40 degrees F.
And that brings us to the evaporator, component #4 in the air conditioning circuit and cycle diagram. There will be relatively warm air flowing over the evaporator coil, lets say about 80 degrees. The air conditiong system is designed so that the refrigerant will evaporate in the evaporator at a temperature of about 40 degrees, so that it will be cold compared to the warm air flowing over it. The system is designed so that the heat in the warm air flowing over the evaporator will be absorbed by the cold evaporating refrigerant. This cools the air flowing over the evaporator, and is the reason cold air blows out of your air conditioner. I hope this air conditioning circuit and cycle diagram has helped you understand air conditioning systems, and once again, feel to copy it and print it out. 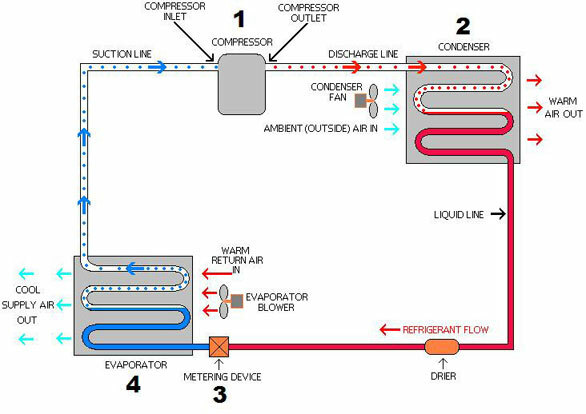 You'll find a more complete diagram that you can use for troubleshooting, with some tips about the operating characterisitcs to look for, in our System Evaluation Manual; and please, feel free to contact us with any specific HVAC questions you might have, including questions about air conditioning on Guam, and refrigeration on Guam. Return from Air Conditioning Circuit and Cycle Diagram to the Air Conditioning and Refrigeration Guide home page.